Nancy is our Executive Administrator who has a lifetime of real estate experience and wisdom. She enjoys working with people and providing the highest level of service in everything she does. For example, she just finished her term as the president of our Grants Pass Lions Club! Jerry is a very experienced and kind gentleman who values service and professionalism. He made real estate his 2nd career in 2002 after spending 30 years in the wine industry. He strives to provide the highest level of service when working with clients. We are very lucky to have him on our team! Cindy brings experience and exuberance to our office. She is simply amazing in her ability to provide excellent service and fresh resources to our office, agents and our clients. She exemplifies Service Above Self and Excellence. We're looking for highly motivated Real Estate Brokers to join our Team. No matter your experience, we offer all levels of training. There are also opportunities to join our office. Please let us know if you have an interest in learning more! We insist on professionalism, integrity and a commitment to service above self. We listen with our hearts and work with you to provide personalized service so that your real estate goals are accomplished. We take the fear out of Selling: We are very skilled at helping Sellers get into their next home before they have to move. Just ask us how! We help reduce the stress of buying and selling a home through having many local resources to help you prepare, inspect, repair, resolve any challenges and get ready for your move. We understand that our communication and availability are key to a successful and happy real estate experience & transaction. Even when you're not looking, we "have your back," as if you're family. This is what we do. This is our chosen professional career. We work hard so that when it comes to real estate business you'll insist that your friends and family, work with us, too. Don't negotiate without us! With over 50+ years experience (combined between us), we have developed superior negotiating and problem assessment/resolving skills. We bring creative solutions & local resources for a successful purchase/sale. 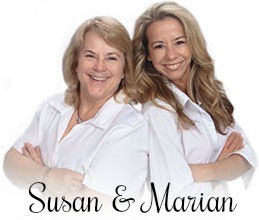 We have worked with Marian and Susan for years. They have helped us buy/sell four homes now. Delightful and experienced. We would absolutely recommend these two gals for your search of the perfect home for you and your family. Working with Susan and Marian was such a good experience for me. I was purchasing a home out of state in Oregon while living in Colorado. Going into this scenario it was a little daunting and thought it would be very difficult but they both made it extremely easy for me. Not only did they help explain the process thoroughly so I wasn't left questioning what was happening along the way but they were over the top with the effort they put in with running back and forth to the property for me to let in the inspectors, appraisers and contractors. They must have made at least 10 trips from Rogue River to Wilderville and that was just for the property that we decided to purchase. She was always very adamant about not making me feel like it was an inconvenience for me to ask to look at property after property until we found the right one. She made sure to go over all the details and foreshadow any potential issues or problems that may come up in the future and it ended up saving us a lot of money. There's one thing that I know about myself is that I'm impatient and I worry about all the small details, they never made me feel like I was being a hassle at all. I could go on and on about the benefits of the experience but I assure you if you pick them as your realtor you won't be disappointed. I know who to suggest to my friends if they need a realtor in this area. Thanks again Susan and Marian you guys make one amazing family team! Bought a Single Family home in 2016 in Talent, OR. From start of House hunt to close of Escrow my home search and purchase took almost 3 years. During that time Marian and her Broker Partner Susan Jaeger were always available to answer questions on new listing and show me properties until I found the perfect one. Then when water damage occurred and threatened the funding of the deal, Marian and Susan were by my side making sure I was making informed sound decisions and their experience in the Realty Field helped to secure addendums that protected me and my assets as I fought to save the little house that I loved and the Real Estate Deal. This Ladies are Amazing and can help you find whatever you may Dream!!! Give then a Call you won't be let Down!! A true professional! I would recommend her to anyone looking for real estate. She helped us look for our home and made it such a fun experience. We encourage anyone that is needing a realtor to contact Marian Szewc! Bought a home in 2016 in Rogue River, OR 97537. I am so grateful my sister-in-law recommended Marian and Windermere Real Estate Southern Oregon..She was professional, accommodating and made the process of buying our first home easier to navigate. Marian knows Rogue River and the surrounding areas and was able to guide us through all of our home buying needs. I highly recommend Marian and will definitely use her expertise again for my next real estate investment!! We down sized from a larger home . Marian was able to get our full price .. continued to work with us for several months and a number of properties until we found our current home. Marian is a staunch advocate for you and works hard to protect your interests whether you are a buyer or a seller . Sold a Single Family home in 2017 in Rogue River, OR. In our families time of need, Marian came to us and was able to address our needs and help us more than we could have imagined. While were were unable to properly prepare our home for sale, Marian and her team took care of everything. Our transaction was seamless and stress free. Bought a Single Family home in 2017 in Grants Pass, OR. I definitely recommend Marian Szewc as an excellent realtor. She was very helpful in helping us find a new home is a city that was 4 hours from our previous home. We relied on her heavily to guide us to the perfect home and through a process that we are inexperienced with. She was always professional and never pushy. She always responded promptly to any communication we asked of her. She is very friendly and easy going but also a great advocate for us when needed. She is very knowledgeable about the home buying process and hard working. We are so glad she was recommended to us and we are very happy in our new home! Marian is simply the best!! Shortly after we walked into Windermere Real Estate in Rogue River we felt certain that Marian would be the Agent that would help us find the home that was RIGHT for us. Her dedication to that put us at ease. Her knowledge, professionalism and friendly attitude was just what we were looking for. She held our hands and walked thru this journey of buying a house and we can't thank her enough! !